Dead State sounds really cool. It's an isometric "zombie survival RPG" in which you not only have to hold out against an uprising of the undead, but must also deal with the needs and problems of your fellow survivors. Our alpha review described it as "promising" but noted that it suffered from too many bugs to be worthy of a recommendation. I'm hopeful that the final release version has been appropriately tightened. Work has been ongoing since that early review: A beta version of Dead State came out in late August and several patches have been released since. Developer DoubleBear Productions said the current Early Access version is "essentially the final game," although balancing and content additions are still underway. But the seven day limit has been removed, and the team is confident enough in the game's progress to settle on a launch date of December 4. It will be available on both Steam and GOG, and go for $30. 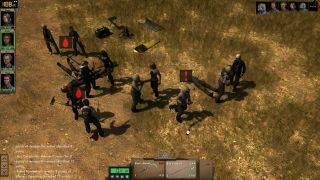 Dead State features base-building and turn-based combat inspired by games like Fallout and X-COM, but it's the promise of "complex character interactions" that has my attention. As anyone who's survived a zombie apocalypse can tell you, the real trouble comes not from the hordes of the shambling undead, but from all the jerks who somehow manage to avoid being turned.